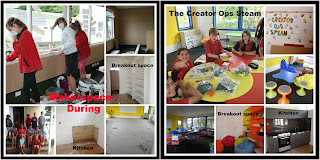 We are nearly finished and can't wait for the start of the year to explore, create, design and experiment!! The carpet and vinyl are going down at the moment - along with a few challenges for the carpet layers! The painting is almost complete and it looks amazing. We're looking forward to sharing this with everyone in the New Year.